The course seemed very practical with lots of realistic briefs, a variety of creative work and good industry links. "The course seemed very practical with lots of realistic briefs, a variety of creative work and good industry links." "I enjoy the fact that I am constantly meeting new people and have the opportunity to work with others who enjoy the same things as I do." Has the course included any live projects or briefs? "I recently worked on a project for Notts TV creating an opening title sequence for the 6.30 show. This was very beneficial as I got to work with real clients. There has also been a collaborative project with Fashion Communication and Promotion where we created a fragrance brand; it was great being able to work with another course." Has the course included any guest speakers or lecturers? "There are a variety of speakers that come to the University to give us lectures. Recently, American sign painter Mike Meyer gave us a lecture and hosted a workshop; it was very inspirational as he was so enthusiastic about his sign painting talent." How did you find your study trip to New York? "We did so much in a short period of time which involved visiting iconic landmarks such as the Empire State Building, Central Park, Brooklyn Bridge, Times Square, Grand Central Station and Ground Zero Memorial. I think the trip has benefited my studies as I have been introduced to a new culture which has made me think about designing for a wider audience. Visiting the design agency Mucca Design was really inspiring and we got lots of useful advice. This whole experience will make a great talking point with future employers." 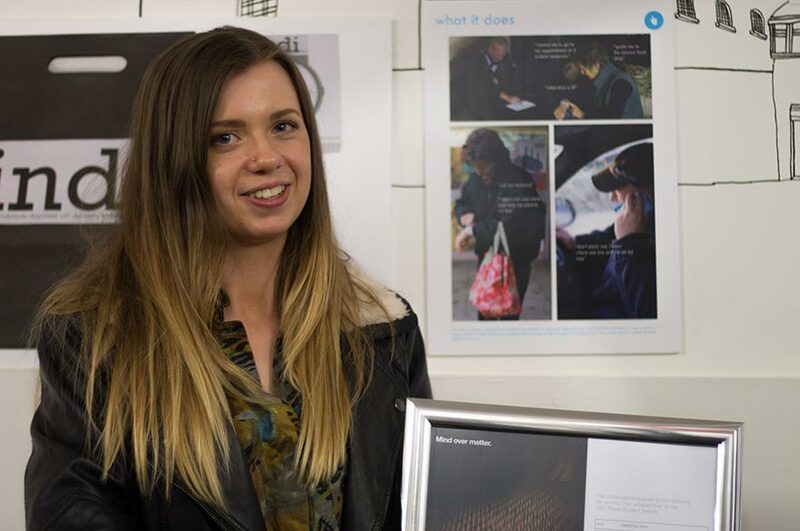 How did you feel about being announced as one of the winners at the MPA Roses Student Awards? "I attended the awards ceremony for the opportunity to network and was very shocked when my name was announced. I am pleased that my hard work paid off. Taking part in these competitions is extremely beneficial as they give you confidence in your ability and recognition in the industry. Attending the awards ceremony gave me the chance to meet industry professionals who have provided me with some great opportunities."